I notice a lot of blogging events themed on ice cream or other frozen treats this month. With the mercury on the constant raise, its fair to treat ourselves occasionally, may be often. Both G and I longed for something cool and refreshing as the temperature in my area is 116F for the past two days. I was not in the mood to make ice cream (Again, after that decadent semifreddo). So, I settled for granita. Unlike ice cream or sorbet, granitas are easy to make. They don’t require any special gadget, cooking or expertise. They are relatively low-fat too. My newly bought margarita glass is also one of the reasons, I must admit. While taking photos, G and I had a disagreement. I wanted to take a shot in the natural light, while he wanted a night time shot which will heighten the red colour of the granita. I couldn’t decide between the two as I liked ‘em both. To end the feud, I am going to post both the photos. Tell me what you like – the bold and colourful nighttime shot or the minimalist daytime shot. Make the simple syrup by adding 1 cup of sugar to ½ cup of boiling water. Stir until sugar has dissolved and the solution becomes clear. Cool and reserve. Blend watermelon cubes, simple syrup and lemon juice until smooth. Strain and taste the juice. It should be very sweet and with noticeable lemony taste. It looses some of its taste when frozen. Pour the juice into a 9x13 baking dish or any shallow container and freeze for 3 hours. Scrape the mixture with a fork until its fluffy. Freeze again. Scrape and fluff the granita before serving. This goes to A Fruit A Month – Watermelon, hosted this month by Jai and Bee of Jugalbandi. Thank you Maheswari for creating this event which gives the fruit kingdom the respect it deserves. As much I am tempted to send this to Nupur for W of A-Z Indian Vegetables, I am restricting myself, because, this neither is a vegetable nor it is Indian. I have to come up with something else, Sigh! thanks for this beautiful entry, suganya. i prefer the night shot. 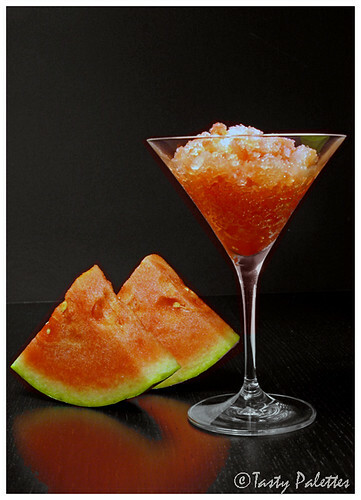 Watermelon Granita looks great! I like both the shots.though the shot taken in night looks inviting! Very pretty glass of Watermelon Granita! 116F!!! Phew! scary just to think of it.Be safe and cool Suganya. I love the first two photos.Both are beautiful. Fabulous photos. I am going to side with G. That is a really simple granita to make. all your pictures are great. I found out many blogging events here. But I have joined only one so far. :) Hopefully I will join more. I prefer the daylight shots. I love how refreshing it looks. Sorry,Suganya. I am going to go with the night shot. 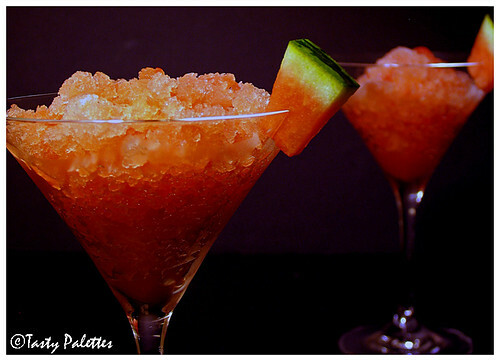 Granita looks way sexier in that shot. Granita does sound refreshing and delicious. I like the night shot - it gives it a romantic touch. a great one where as the shot in the light is giving a clearer picture of granita. Decisions, decisions. In order of preference, I go w/ #2, #3 & #1. The night shots clearly work (especially, I think, w/ just a hint of fruit #3), but will always favor natural light. Is this the similar post you alluded to, Suganya, when I posted my granita? I assumed you were going to do violet, too. I hope you will sometime even if a different sort of recipe. Can't get enough of your photos. this is just so mouthwatering! Hi Suganya, I don't think I could choose so easily between those two photos -- both are striking. Lovely dish! Perfect professional shots!!Amazing!! !love the glass cup and the dessert!!!! Susan, This is the post i had in my mind when i told you i have a similar idea. I love violet too. Will post something when i can. Absoutely professional looking photos. Loved all the shots,but the night time shots look absolutely out of this world, there is a very distinct and captivating look to the granita in those shots, as if the light is coming from within. Slowly cayching up with everyones older recipes. 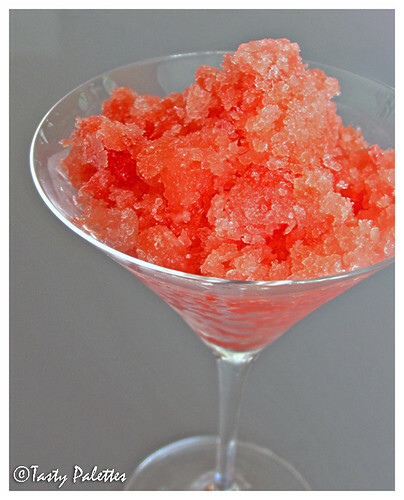 water melon granita is lovely! pictures are great! Cooling for summer. Day shot for me. :D Beautiful! hi i think ill try your watermelon granita today i have a watermelon that has been sitting heavy in my fruit basket for way too long.........and by the way i love the minimalist lookkkkkkkkkjust that i can see the granita more upfront...............have a nice day.